The Democratic Republic of the Congo has been urged to investigate at least 421 bodies found in an unmarked burial ground in the capital, Kinshasa. A foul smell led residents to the site in March. The government says all the bodies were buried in a single night and include stillborn babies and unclaimed bodies. But Human Rights Watch says they must check to see if any of the people killed during anti-government protests in January have been buried there. Dozens of demonstrators died in protests over a proposed electoral law change which would have required a national census to be held before the presidential election could take place. The US-based watchdog Human Rights Watch (HWR) has said that bodies went missing during the protests and also during government crackdowns on criminal gangs in the capital last year and in 2013. Human rights workers first became aware of the burial site after residents of Maluku in Kinshasa reported a terrible smell near the local cemetery more than two weeks ago. A woman working in the field then discovered a limb sticking out of the ground. 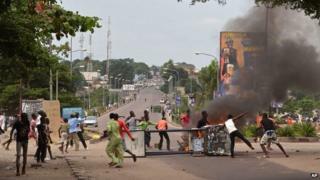 The DR Congo government has said that the bodies were all buried in individual graves on 19 March. A spokesman said on Monday that there would be no exhumations of the bodies.